Newport Cricket Club will run the Event throughout the day, providing scorers and umpires. All cricket kit provided if needed. Licenced Bar and Refreshments available throughout the day. Each Team to be allocated a Glamorgan CCC Player. Enjoy a Buffet lunch before the Event. Play a minimum of 3 fun Six A Side matches. Enjoy a B-B-Q after the Matches prepared by Nando's. All for £300 per Team. 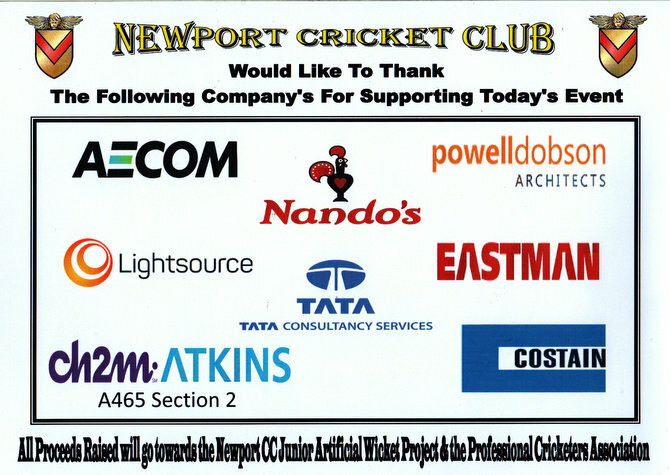 Help Support Newport Cricket Club. 2017 Corporate 6 a Side Cricket Day. who had travelled back from Durham the evening before. only arriving back home at 2.30am. it was a fun day and all who witnessed the event thoroughly enjoyed the day. Eastman went on to win Group 1 whilst Costain won Group 2.
with the star prize being an MS Dhoni Autographed Bat. The day was rounded off with a BBQ put on by Nando's. A massive thank you to Nick, Rhys and their team/staff. A Brilliant Day.... Thanks to all those who supported the Event!